Note: Bookings are based on Beds required. If you are 1 guest wanting your own room you must enter 2 adults for correct pricing in the HOMEAWAY/STAYZ calculator OR please apply for full rates or read further below in description. eg 3 single adults wanting 3 separate rooms MUST enter 6 adults for correct pricing. Kelly House offers 3 luxury Queen rooms with 3 ensuites. A sofa bed can be set up for a 4th couple in one of the 2 living areas and a 4th toilet and hand basin serves this area. In addition to the 2 wood fireplaces, it offers A/C and heating via a ducted split system throughout each room of the cottage with individual controls to each bedroom. It also includes a large smart TV & dvd & stereo radio/cd player. Wifi and Netflix are also available. Kelly House is one of 3 cottages at "Kelly & Wright Luxury Accommodation" offering traditional ,historic and unique luxury accommodation and eco friendly. Other places include Pickett Cottage and Wright House. All up "Kelly & Wright Luxury Accommodation" will accommodate up to 20+ guests. (Further accommodation is also available at "Beeches on High" which sleeps 12). Kelly & Wright Luxury Accommodation have been named after the historic 20 round bare fisted fight that Ned Kelly had with "wild" Wright over a horse theft that Ned was jailed for after he brought it from Wright. The fight took place on this property at the rear of the Imperial Hotel that was once thriving here in its hay day. Kelly House, was originaly called "Glenwood", is circa 1895 and was relocated in November 2006 from Berwick (Melb). It has been restored and renovated to a luxury self contained cottage with open fires (x2) and includes all the character of 19th century charm that contributes to the 3 gorgeous bed rooms each with ensuites (2 with spas). With the enviroment and carbon emissions in mind we are also Eco friendly offering tank water servicing all toilets and garden, and solar hot water servicing up to 20 showers per day from the Sun. A 5kw grid solar electricity system has been added to service the majority of electricity used during your stay and to save on Green house gases. Note: Rates in STAYZ Calculator for additional adults requires Entry of Min 2 person for booking extra rooms. Cost is same for 1 or 2 persons in staying in Queen bed. 2 nights preferred weekends, 3 nights long weekend and 4 nights Easter. Includes Spa bath, separate shower , toilet and basin. Ducted heating & cooling throughout house. Open wood fire in lounge. Wifi and Netflix is available. Living room , dining and kitchen as open room plus separate lounge room with wood fire. Full size fridge / freezer. Plunger Coffee Jug with ground coffee made available in fridge. Deck area overlooks beautiful lawn below. Balcony to front connected to large deck at rear with BBQ. BYO Kayak or canoe and paddle around Lake Sambell. BYO Boat allowed on Lake Sambell for fishing . max 5 knots. Large elevated deck overlooking Spring Creek reserve. Very nice! Gold course available in Beechworth nearby. Kelly House offers a great location right in the heart of town for a group or 3 couple getaway each having their own luxury Queen room and ensuite. A fantastic house, warm and cozy and very well equipped. And a superb location also, so close to the town centre. Just perfect. Great you have enjoyed the house. We love Kelly House and it certainly is a favorite to many with its location to town, the creek outlook , its privacy and of course the ambiance throughout. Love to have you back again. Thankyou Claire for a wonderful review. We aim to always offer well appointed luxury accommodation so everyone who stays feels at home and comfortable. 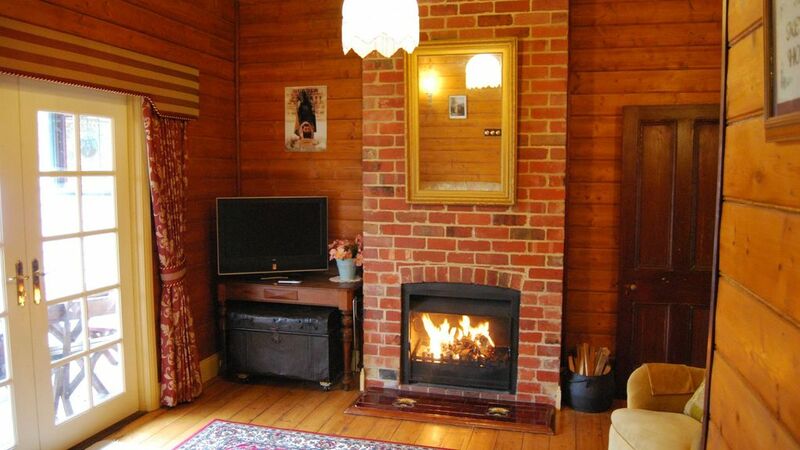 A great home right in the middle of Beechworth. The 3 bedrooms with ensuites suited our friends perfectly. Will definitely stay again when visiting Beechworth. Thankyou for your kind response. We endeavor to make Kelly House house a great luxury escape for all guests and certainly the 3 luxury Queen rooms with 3 ensuites ( 2 spas) + open fire makes it a ideal place for a group like yours. Look forward to hearing from you again. John & Jen. This is an excellent property. The 5 of us thoroughly enjoy our stay at Kelly house. The presentation and quality inclusions was magnificent. We will come back to stay again. Charming perfect and surprising with room to spread out. Very well equipped. Fantastic views, garden bird life. Property is located right in the heart of town, only 50m to shops and cafes and restaurants.